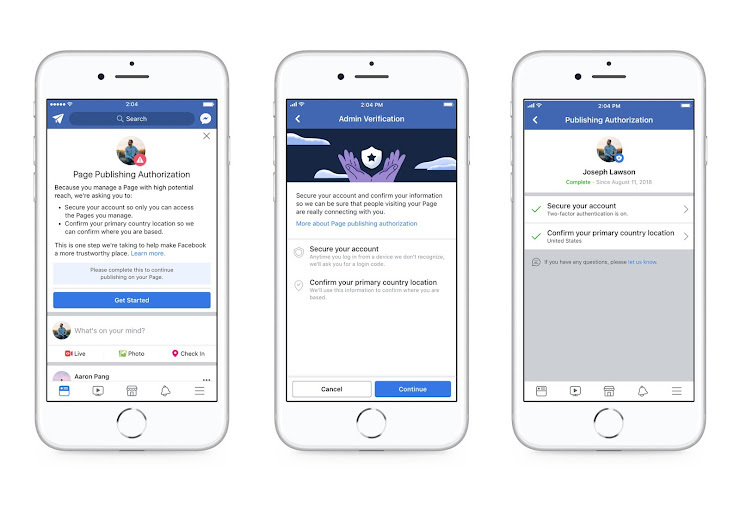 Facebook is taking new measures to ensure the eradication of false identifications when it comes to Facebook accounts. This time the target seems to be the pages with a considerable amount of followers. This verification process will require the managers to perform an authorization process. This process will ask for the confirmation of the primary location and country along with securing their accounts with the infamous two-factor authentication. For now, only the pages with the huge following are required to undergo these specifications, not all. The pages that come under this category will be alerted via a notice atop their News Feed. The page will not be responsive to their posts until they complete this process. According to the company, this will prevent any false account holders to host a page, hence putting the security at risk. For the visitors to those pages, there will soon be a detailed information displayed about the history of the page as well as the people who own/run it. These snippets include whether or not has the page ever changed its name or undergone a merger with another. These updates are in continuation of Facebook's efforts regarding increased transparency. The company also acquired political ads to unveil the face that was behind their funding. Also, it removed a number of sketchy pages that seemed to be involved with the entire ordeal. These policies will be enforced by the end of this month according to Facebook. Not only this, but they might also be implemented on Instagram as well. Let us hope these efforts by Facebook do not go in vain and actually improve the site’s privacy and security.